My Notting Hill mini is finished and is up on the wall in my sewing nook! It's hard to really capture the matchstick quilting with such busy fabrics, but these two photos below give a better idea. I LOVE it! I wouldn't do it on a project much bigger than this, and definitely not on something that I wanted to be soft and snuggly, but for this type of project it is perfect, or for anything like placemats, runners, etc. Uses a lot of thread though so be prepared for that! Next topic. Now, I am the last person to be talking about technical things but I have something to say about the whole 'No Reply Blogger' issue. I am currently holding a giveaway and so have received a lot of comments. Many of them are 'no-reply comments' which means that in some cases I have no way to respond. Any of you who have held giveaways on your blogs know what I'm talking about. I have always thought that these commenters just don't know that they show up as no-reply and that those of us who do know can help by sharing how to fix the issue. Lots of non-Blogger bloggers (if that makes sense! ha! I'm talking about Wordpress blogs, Typepad blogs, etc.) include their email address on their website and many times if you actually click through to their blog from the comment, even if they show up in your email as no-reply, you can find some way to contact them. 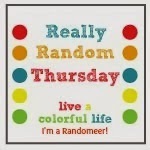 Let's have a little love for non-Blogger users, shall we?? The ironic thing is, it's a Blogger (put out by Google) problem and yet it's us Blogger people who make such a big deal about it. Now, there are also many people who happily comment using a Blogger account (lots don't actually have a blog themselves but still have a Blogger account), but do not have an email address associated with their account. In these cases, there truly is no way to reply to the comment. So in reference specifically to my current giveaway, if one of these commenters is the winner I will not be able to contact them, therefore a new winner will be chosen. It is these who could benefit from articles like this one that describe how to make sure that an email address is associated with your Blogger account, if that is what you want. It's so gorgeous Heather! I completely know what you mean about the thread matchstick quilting uses though - that's why I was panicking I'd run out on IG today (still pretty sure I will run out!) It is a gorgeous result though. Your quilt and quilting are gorgeous! As for the "no-reply blogger" fiasco, I wanted to mention that Blogger will randomly reset your preferences to "no=reply" if you switch from the Blogger profile to the G+ profile or vice versa. I was coming up no-reply for awhile and had no idea until the fabulous Molli Sparkles pointed it out. I've tested this and it happens most of the time, but not all of the time. So, for us Blogger users it's a good idea to check your settings from time to time...or just bite the bullet and switch to Wordpress, which it seems more and more people are doing..but that also seems like a lot of work and a whole new bunch of issues! Your wall hanging looks beautiful, I love the quilting and all of the different colors. Your mini quilt is gorgeous. Beautiful colours and love the quilting. As for no-reply, it drives me nuts. I do the odd giveaway and I am constantly finding that loads of comments are coming in as no-reply. Giveaways aside though, I just like to reply to peoples comments and find it frustrating when I can't and often wonder if the commenter thinks I can't be bothered to reply. I've now started replying to those comments on my blog when I can. beautiful!! Love the quilting! I agree the google owns the world thing is annoying but really how hard is it for anyone (including wordpress people) to leave their email like you said?! We're all busy people! I adore your mini! Yay for trying that time & thread intensive method - SO nice! And what a nice post about commenting. Very helpful and well-written. Thanks. Hmmm, I wonder. . .from my experience with "no-reply" - many Blogger readers are also no-reply, especially those who use Google+. I have readers who use other blog formats that are NOT no-reply and do not have a Google account. The whole issue remains a mystery and well beyond my pay grade to supply a solution; if there even is a solution. I have never left comments before this Blogathon started. I am having fun with it and may continue. I created a google+ ID to do so. When I click on some of the other google+ ID's I can see an email address. I think I have set mine to do that, but I am not sure. My email address is deliving@telus.net. Can you see it on my Google+ ID? Love the mini! Tough how DO you get it to stay up with tape?? It frustrates me because I do like to reply to every comment, and I don't always have time to find an email off a Wordpress site, if there even is one. But I also know sometimes Blogger/Google screws things up - you let me know last time I changed something totally unrelated to my email and I suddenly became a no-reply! 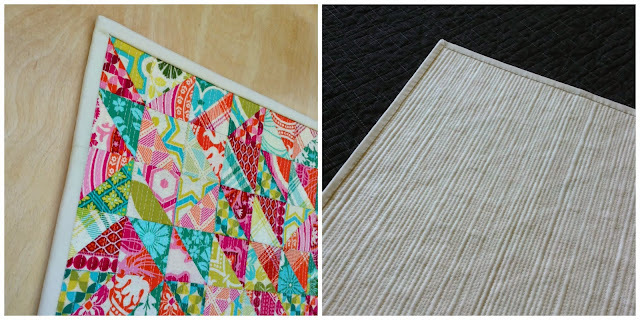 Really love your mini and I would also like to try the matchstick quilting on a smaller project too. Interesting about the blog comments because I am just getting into this. I recently switched from blogger to typepad, but cannot comment on any blogger post UNLESS I am signed in through Google. I left my old website open with a link to the new site. I was hoping to close it, but I guess for now, I am stuck with it. Looks awesome Heather! What an awesome way to use up those itty bitty scraps. I love your matchstick quilting, and your little quilt! I actually set up a wordpress account and blog just to address the comment thing. I do search about for prize winners and see what I can do. I have left comments on blogs to get in touch with people where the commenter is no reply and there is no email on their blog either. I do try to remember to remind people in give aways too. In the end, if people want to win they need to be sure that they are able to be found. Gorgeous! I always love seeing wall quilts with dense quilting, I think it makes them really pop. Yours is gorgeous! It's gorgeous, Heather! The quilting looks great! I absolutely love the quilt! Tiny piecing - amazing! Just wonderful! Love the quilting, i want to do this quilting on a big quilt someday! Gorgeous finish, Heather! Looks right at home in your sewing space. It's so pretty. Gah. I'm having the same issue with comments left for my giveaway. I feel bad that there are so many that either don't know they are no-reply bloggers or they prefer it. Thinking that from here on out, any time I have a giveaway I will ask that EVERYONE includes their email (in hopes of helping those that think they aren't no-reply bloggers). Thanks for the link to the no-reply blogger thing. We'll have to do a post about that soon too!